← ‘Godless Cities’ and ‘Religious Enclaves’? The Distribution of Religion and Nonreligion in England and Wales. Human responses to disasters bring to light issues that debates over the nature of ‘nonreligion’ often do not address. There is a long tradition among nonreligious writers to assume that natural disasters undermine and refute religious belief. Voltaire’s famous poem following the Lisbon earthquake of 1755 is perhaps the paradigmatic expression of this tradition, while the reaction of the Guardian’s Martin Kettle to the Asian Pacific Tsunami of 2005 serves as a more recent example. What many authors observe, however, is that the impact of a disaster on nonreligious individuals and cultures can also result in the opposite response – leading them to re-examine religious traditions or questions that had previously held little interest. ‘The disaster takes care of everything’, observes Maurive Blanchot. A catastrophic event, in other words, has the capacity to overwhelm and redefine an individual’s experience of ‘reality’, leaving that person scrambling to recover some sense of meaning. Such a process of constructing new discourses of meaning, and strategies for coping with suffering, can be understood as a ‘secular theodicy’. This dynamic is captured (all-be-it, crudely) in an old cliché: ‘there are no atheists in foxholes’. Some contemporary scholars are thus interested in how the interruption of a disaster leads many people to draw on religious language to articulate the enormity of an event on their lives, including nonreligious individuals. An example from Japan illustrates such a phenomenon. The work of the artist Koki Tanaka offers a nonreligious examination of how people respond to unusual situations and in the process must construct new attitudes towards meaning. By exploring this issue as a way to examine how people cope with disaster, his work resembles the process formerly associated with theodicy. Tanaka’s series ‘Precarious Tasks’ is a collection of short films that respond to the earthquake and tsunami that struck Japan in March 2011 (the ‘Tohoku earthquake’). As he describes it, the thematic question his art asks is, ‘How can we share, or take possession of, the experience of events?’ His series investigates how people collaborate with each other when forced to adapt to unusual situations. These staged ‘precarious tasks’ include employing skills like cutting hair, playing the piano, shaping pottery, or writing poetry. When Tanaka gathered five pianists and assigned them the task of playing one piece of music together on a single piano, he selected musicians studying different genres like jazz, classical, and improv. Similarly, the nine hairdressers assigned to cut one head of hair were drawn from different ethnic groups, and all had varying levels of experience and skill. The point of such experiments was to observe how people respond and adapt to strange situations like post-Tohoku Japan. The abstract nature of Tanaka’s videos is part of their power to stimulate imaginative alternatives to habitual patterns of behavior. But it would be a mistake to respond to them in a sentimental fashion. A simplistic and cursory response might well conclude that the videos imply that human beings are cooperative by nature, or that ‘adversity brings out the best in people’. All too often, people react to interruptions and surprises by panicking and retreating, rather than by cooperating. Moreover, even when human beings respond to extreme situations (for example, an earthquake) by reaching out to help their neighbours, these acts are generally occasional and temporary. Once a situation is stabilized (the wreckage from the earthquake is cleaned up), patterns of interaction that were in place prior to the disaster are often quickly re-established. This is why Tanaka focuses on the attitude that the participants take toward the outcome of the precarious tasks. What comes into view in his work is the necessity of accepting that, sometimes, the collaborative process simply does not work. A haircut may turn out terribly, a piece of piano music is a chaotic mess, a poem ends up a complete shambles, and the pottery bowl sometimes collapses. What the artist hopes the participants will learn, however, is that ‘even if a haircut turns out wrong, hair grows, then you can cut it again. If a performance does not go well, play the piece again.’ In this way, the rituals of cooperation are shown to be intimately linked to the imaginations and attitudes of the participants. A certain ‘moral’ or ‘spiritual’ perspective is as much a part of the performance’s ‘effect’ as is the tangible outcome of the task. In these performances, in other words, Tanaka is exploring what attitudes and beliefs help people cope with suffering, fear, and confusion. He is fascinated by the process of reconstructing a sense of order, in a situation in which a prior sense of structure and meaning has been destroyed. This dimension is evident throughout the rituals conducted in the ‘precarious tasks’. Tanaka seeks to highlight the ways in which human societies tend to stress the ‘results’ of any given effort, and fail to appreciate the significance of the processes we are engaged in as we seek to achieve these goals; ‘The “result” comes in a moment. But crammed into the process prior to and following [it] are a great mass of complex things’. As he explores the shift in attitude required to reorient people’s imaginations in this way, Tanaka’s work addresses questions such as the following: how do we deal with loss, experiences of vulnerability, and the reality of our finiteness. Such issues are exactly what theologians engage in when studying theodicy, only Tanaka’s version is deployed in nonreligious terms. These ‘Precarious Tasks’ highlight how issues of identity, meaning, and orientation towards the future are often profoundly disrupted by intense experiences of insecurity. The questions Tanaka explores thus resemble those formerly associated with religion in general, and theodicy in particular. These artworks bring into view how one of the challenges of our environmentally unstable era is to learn how to pattern our lives in the presence of ongoing threats and uncertainties. As such, Tanaka’s work can be understood as exploring the nature of ‘secular theodicy’. How do the disruptions and fears that contemporary disasters confront us with impact on how we construct meaning and a sense of order? His work suggests that learning to cope with such a challenge is an important task, if our fears over the next possible disaster are not to rule our lives and thus, as Blanchot warns, ‘take care of everything’. 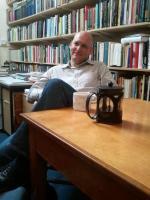 Christopher Craig Brittain is Senior Lecturer in Practical Theology at the University of Aberdeen. He is the author of Religion at Ground Zero: Theological Responses to Times of Crisis. This entry was posted in Expanding the Field, NSRN Blog and tagged art, Christopher Craig Brittain, disaster, Koki Tanaka, nonreligion, secular theodicy. Bookmark the permalink.